I now have a full set of War Diaries for the South Staffordshire Regt. WW1. 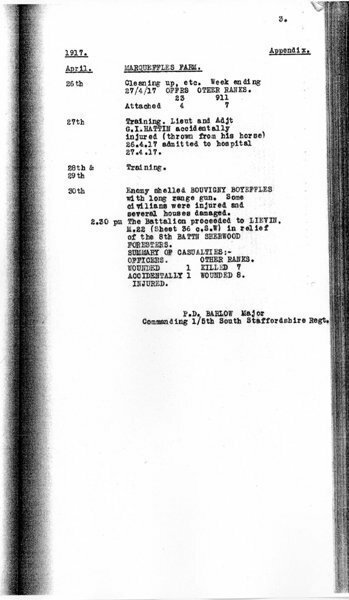 Could you have a look at the 1/5th Battalion Diary for me? My Grandfather, 1103 (201486) Pte. Richard Morgan, left the battalion when he was sent to hospital on 22.4.17. He was transferred to England on 27.4.17. I know it's a long shot, but could you look up the diary and see if there is any mention of him? On this and two other posts I'm sending you scans of the diary for April '17 but unfortunately Pte. Morgan is not mentioned although others are!? Looking at the scans (see 3 posts above) I've just done some sums. There were eight Other Ranks recorded as wounded, seven of them are named. Your GF must have been the other one. What was the reason for his evacuation? Roy - All mentioned bar one, and that might be the one I'm interested in. Story of my life. I believe he was sent to hospital with frostbitten hands. Not really a wound as such, I suppose. Maybe he was not named because he was just lumped in with the other men (I suppose there must have been some) who were temporarily taken off duty for medical reasons. After a spell in hospital, he could have been expected to return to duty. They wouldn't have known at the time that the frostbite was serious enough to get him sent back to England a few days later. What do you reckon? I would have thought that anyone going off active service, even for a short time, would have to have been recorded so as to be taken off the Battalion effective strength. As we have discussed off-forum, the 1/5th were better than most at recording O.R's. by name and it seems very strange that 7 of the 8 are identified. I hesitate to suggest this but I wonder if he was not mentioned because initially there was a feeling that it may have been a self-inflicted wound? It could be, Roy, and there's no need for hesitation in suggesting it. But I think that this would make it even more likely that he should be named. First of all, the 1/5 was, as you say, very thorough in this and secondly, if a man had avoided duty by means of a SIW, then I'd have thought that this would have been commented on. I'm still not sure that that's the answer though. Surely even in a quiet month more than eight men would have been taken to hospital, as well as wounds there were of course VD cases, general illnesses, and it is unlikely that your GF was the only one out of a whole battalion to suffer frost bite. Maybe (when I get it) a more in-depth study of the Nominal Roll may throw some light on the situation. Roy - thanks very much - if you can spare any time to have a further look and a further think, and can draw any conclusions I'd be very grateful. I know that the winter of 1916/17 was very bad, but I don't know whether things were still that bad in April. My source for frostbite as the cause of hospitalisation and return to England is based on what my Grandmother and my uncle told me. She told me that my grandfather had cut his hands badly on barbed wire. Her brother added to the story by saying that the end result was frostbite. I'm the first to admit that "family history" accounts of people's war service can be shaky. One thought of my own - you say, "Surely even in a quiet month more than eight men would have been taken to hospital" but if I understand the entries correctly, the war diary doesn't actually say that any of the 7 named wounded ORs were sent to hospital. Just another thought, Roy. In my few photocopied pages from the nominal roll there are about half a dozen men with the sick to hospital entry "S to H", like my Grandfather has. I've also noticed a couple of men with "W to H" which I think must mean "wounded to hospital." The nominal roll seems to be making a distinction between men sent to hospital wounded, and those sent sick, and I wonder if the Diary makes a distinction, too. Can I send you a couple of names and dates and would you mind seeing if the other men marked "S to H" are mentioned in the Diary? Following the above discussion with great interest. Do you happen to have any information on 240790 L/Sgt. John Henry Camp of C Coy, 1/6th South Staffords who was killed in action 24/06/1917 and what the battalion was doing in the run up to that date. Post their names and I'll see what I can find. Looking through the various diaries, there seems to be no standard format of reporting these things, we have previouly noted that the 1/5th S. Staffs were unusual in recording O.R's. by name and for each of the months before and after your GF's evacuation there is over a page of casualties listed by name together with their death / wounds etc. Other diaries just summarise "Killed" "Wounded" and "Missing" and yet others lie between these extremes. Just having a slight panic attack here - June and July 1917 are not where they should be in the diary. l'll get back to you when I've found them. Panic over, the 'missing' pages were filed in 1916. Four pages cover this action, two for the day itself and two for Operation Orders for that day. Sorry to have caused a momentary panic there. Makes you wonder what caused his death if there was no enemy opposition of any kind to speak of. Perhaps a case of a "friendly fire" short round from all the heavies flying overhead? Do you happen to know if the 1/6th suffered any other fatalities that day? According to SDGW they lost seven men that day, your man included. None of your 'Sick to Hospital' gets a mention. With regards to the 'Wounded to Hospital' men, 1023 Pte. May is noted as 'Wounded' (not 'to Hospital'), despite a two page narrative as an appendix none of the three 13.10.15 gets a mention by name and 7853 Pte. Mayer is also just another un-named O.R. wounded. If you are interested I can scan you any of the pages. Can you please do a look up for a few days before 10/7/17,researching a man who died of wounds on that day, 8095 Serj W.Hallett M.M.